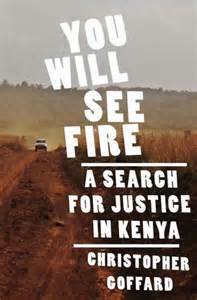 You Will See Fire is the story of John Kaiser, an American missionary, who tried to get Kenyan dictator Daniel arap Moi tried at the Hague, but wound up dead in the bush instead. While telling Kaiser’s story and the story of the investigations of his death, Goffard tells the story of Kenya and life under the Moi regime. Kaiser was a Catholic priest and a member of the Mill Hill Missionary order. He thought that this, along with his American citizenship, would protect him, but ultimately his forthright, uncompromising character made him many enemies among the Kenyan government. No matter how many times people tried to get him to stop or tone down the rhetoric, Kaiser felt that the search for truth and justice were more important. These were values that he was willing to die for, and die he did. This was an amazing story. If you have any interest in social justice, Kenya, or are looking for a book that will make you think, this is the book for you.